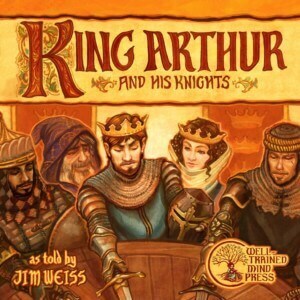 But now, Jim the Bard and Well-Trained Mind Press have re-mastered the original “tapes” so that you can listen to King Arthur and His Knights in a beautiful new edition (available in MP3 or on CD). We asked Merlin to lift the spell of poor audio quality, so this new edition features crisper sound (listen to the audio comparison below). It has also been divided into 10 tracks for easy navigation. Furthermore, it has a gorgeous new cover by artist Rebecca Sorge (that’s “Sorge” like “George,” not “Sor-jah” like “Georgia”). 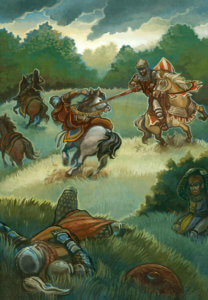 Find the new edition of King Arthur & His Knights here! We’ve also created an exciting new Companion Reader with colorful illustrations of these classic stories, plus instructions and a script so kids can stage their own play!